Sweet version of pancakes, Crepes are a lovely dish to please the senses. Easy to make and loved by kids and adults, they can be served with or without filling. 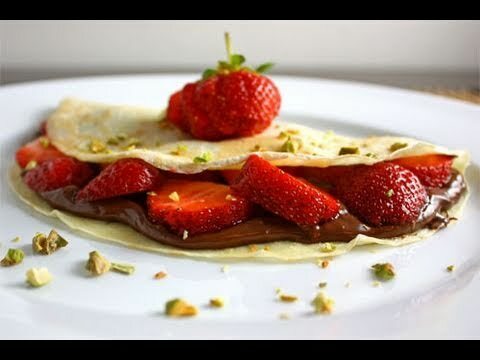 Here’s a simple recipe to make delicious French Crepes graced with Nutella, strawberries and nuts; and you can top it all with whipped cream too! Put the flour and eggs in a blender and blend to mix well. Then add the milk, sugar and vanilla. Blend again to form a smooth flowing batter. Add a little water (not too much) if the batter appears too thick. Place a flat non-stick pan over medium heat and spread a little oil on it. Pour 2 ladles of the batter on the pan and spread it around with a spatula. Cook for about 2 minutes and then flip it over. Cook for another 2 minutes on the other side too. Tip: Take care not to let the crepe surfaces turn dark brown in color. Transfer the cooked crepe to a serving plate. Spread a thick layer of nutella on one surface of the crepe. Then spread slices strawberries on it. Fold the crepe from one side to form a semi-circle. Sprinkle chopped nuts on top and serve. Tip: You can also use bananas for the crepe filling.